If you’re looking for an aggressive TYPO3 CMS 7 vs. Drupal 8 comparison article, keep searching; this isn't it. Although I've included my current opinions at the bottom in Last Things, what ultimately determines which platform is best for you are your particular needs. Today organizations like yours are fixed on beating competition within an modernizing marketplace. And whatever your organization does, you need to launch integrated content marketing campaigns to support differentiation and cater to the changing ways your target market accesses your site. Specifically in regards to e-commerce, cont›ent editors, and mobile devices. These modern challenges call for a dynamic content management system solution. 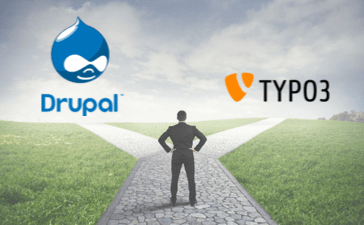 Below, I’ve included insights on how TYPO3 CMS 7 and Drupal 8 each impact organization, user, and end user perspectives. The new version of TYPO3 CMS 7 LTS is now available; it’ll be supported for three years as part of the Long Term Support from TYPO3’s CMS team. This version boasts faster streamlining, a new backend interface allowing editors and integrators to work together more efficiently, extended capabilities within the standardized PHP Package Manager Composer, and new features for developers. The completely redesigned, modernized interface has been equipped with uniform color and clear descriptions and been fully developed in Responsive Design. Furthermore, the functionality for image processing is now being integrated into TYPO3. We revamped Drupal's user interface; added WYSIWYG and in-place editing; significantly improved mobile support; added and improved key contributed modules including Views, Date, and Entity Reference; introduced a new object-oriented backend leveraging Symfony components; revamped configuration management; improved multilingual support; and added hundreds of other improvements. Both of these technologies are said to have been souped-up. Let’s look at what each has to offer. The TYPO3 CMS plugin Multishop is a popular e-commerce business solution, designed to be user-friendly and highly accessible. Instead of a separate back-end system for updating the company catalog, in TYPO3 CMS Multishop, the back office (which allows users to configure the product or offering attributes) is integrated with the front. What this does is present users with a decent WYSIWYG—what you see is what you get—experience. When updating your shop and catalog, users see what end users (customers) see. There are many Drupal e-commerce modules but let’s look at the most popular: Drupal Commerce. Thus was originally developed on Drupal 7, and it seriously benefited from and contributed to the development of Entity API, Views, and Rules modules. Now that a new update is out, Drupal Commerce 2.x will ultimately be rewritten. Drupal Commerce 2.x will reflect the evolution of Drupal 8. Commerce 2.x includes a new store entity type, with many potential use cases for such an entity type (multi-domain stores, multi-seller scenarios, fulfillment centers, etc. ), and contrib can unlock them all. Product architecture means that Node based product displays are finished. Products can now be displayed on their own. Hierarchies are managed with parent-child product relationships within each entity. Prices, taxes, and other transactional changes have been advanced, so a price is now an object that applies a tax rate, discount, and fee to itself. Some content editors find TYPO3 CMS 7's ease of use appealing; its easy-to-use publishing platform supports a wide variety of media (text, video, photos, slideshows). A significant support structure is there, with various resources and an active developer community. There’s also built-in internal localization—and this supports content in different languages, a significant benefit for organizations with target locations in other countries. Work on Drupal 8 took off with content marketers in mind. There’s an easier integration for third parties, such as CRM, marketing automation tools, and mailing tools. It’s an expression of mobile-first development, supporting targeted content creation, multilingual campaigns, and a seriously clean interface for publishers (the non-technical kind). For TYPO3 CMS 7, you’ll find that the base principles are unchanged when it comes to making your website mobile-friendly. TYPO3 has put out a mobile-friendly guide so that websites can be optimized for end-users. If you decide to set up a new website altogether, you can build your site on the bootstrap package extension. This way the frontend theme is mobile-friendly from the get-go. Drupal 8 is mobile first. The goal is to make Drupal the leading mobile CMS platform; it’s a serious initiative. The admin layer is revamped. It’s simple, straightforward, and light. All built-in themes are responsive. Toolbars go horizontal or vertical as needed. This new flexibility enables the creation of highly attractive, highly functional sites that look great on mobile to end users—natural and intuitive. For example, when a user views the page from a narrow viewport, the page’s horizontal elements will automatically become vertical, with less important columns being removed. Breakpoints are built into Drupal 8, which keep track of height, width, and resolution. With such an emphasis being placed on ease of use (for both end users and administrators), D8 had to address the question of responsive images. Administrators can add large photos to their pages that size themselves appropriately based on the viewer’s device. A module effectively reduces file size by resizing the image. 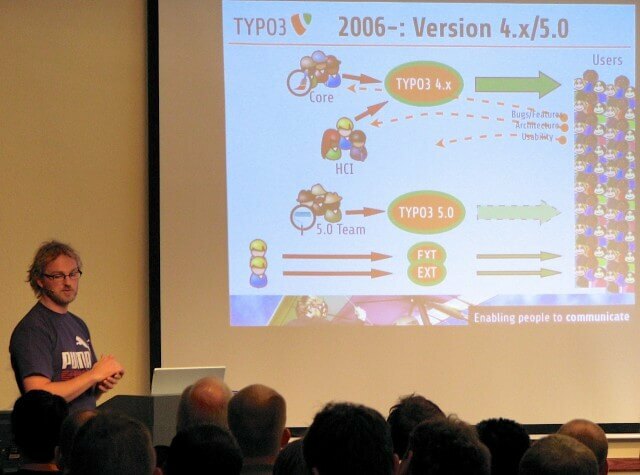 When TYPO3 5.0 was first announced by Kasper in Karlsruhe back in 2006, I was excited because it represented what I felt then were needed changes. An evolution that would keep TYPO3 at the forefront of content management systems as an application framework for handling client needs. Kasper announces the intent and segregation of TYPO3 5.0 from the 4.x branch at the 2006 TYPO3 conference in Karlsruhe. Over the next nine years, I experienced the progression of TYPO3 5.0, Phoenix, TYPO3 Flow, and what's now a separate Neos community. While I'm happy that TYPO3 and Neos communities made the hard decision to separate, it's too late. And, I'm not the only one feeling that TYPO3 CMS 7 progress has been impacted. In my opinion, and I'm feeling like I'm betraying my many TYPO3 peers in saying so, TYPO3 CMS 7.6 LTS is just an excellent continuation of TYPO3 4.x releases. Although it's great to see such fundamental infrastructure and usability refinements happening within TYPO3 CMS, it's not enough for me. The TYPO3 CMS 7 core, at over 15 years old, is not as modern or as capable as it used to seem. So personally, I don't believe that TYPO3 CMS is the right choice anymore, even for a basic website or third-party application integrations. However, TYPO3 CMS 7 does seem like an ok choice for those well supported, large multi-site, multi-lingual, multi-author installations sans external integrations. In the meantime, what was hoped for TYPO3 5.0, now Neos, is what Drupal 8 offers today. TYPO3 CMS might dominate once again, but it has a long, hard, anxious climb ahead. Only make your CMS decision after reviewing current needs of e-commerce, content marketers, mobile users, and third-party application integrations.